Usually cherry tomatoes don’t last long at my house: I nibble on them all the time, pretty much every time I open the refrigerator – I even like them pure, without any seasoning, but they taste especially delicious with a sprinkling of salt (I like Maldon a lot) and a drizzle of extra-virgin olive oil. Yum. But last week I managed to save a handful of cherry tomatoes for this focaccia and it was worth the “sacrifice” – it’s dead simple to make and flavorsome and it’s great split in half and filled with cheese. In the large bowl of a stand mixer combine sugar, yeast and ¼ cup (60ml) lukewarm water. Mix with a fork and stand in a warm place until foamy (5 minutes). To the yeast mixture add the flour, oil, table salt and 200ml water (room temperature). Using the electric mixer fitted with the dough hook knead until a soft smooth dough forms (4-5 minutes). Transfer to a lightly oiled large bowl, turn to coat, cover with plastic wrap and a tea towel and stand until doubled in size (1 hour). Line a large baking sheet with foil and brush it with oil. Transfer the dough to the prepared pan and, using your hands, shape it into a 22x27cm (9x11in) rectangle. Cover with a tea towel and stand until doubled in size (20-30 minutes). Preheat oven to 200°C/400°F. Press tomatoes cut-side up into dough, scatter with thyme, drizzle with oil, season to taste with sea salt and black pepper and bake until golden and cooked through (15-18 minutes). Transfer to a wire rack and cool to room temperature. I love focaccia. I will have to try this one. Oh yum, cherry tomatoes are one of my most favorite vegetables. 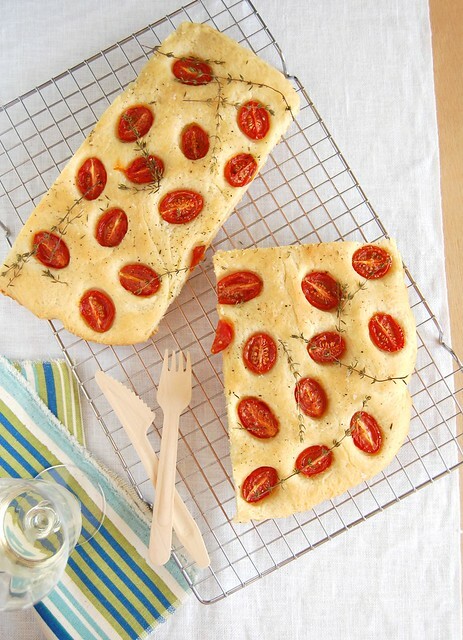 I've just planted 2 pots of them - I can hardly wait until they mature so I can make this lovely focaccia! This looks really moist!!! I would have some now!! Oh how simple and yet so beautiful! I love the colors, and the flavor combination seems out of this world. What a lovely "tribute" to the Hunger Games! Patricia, my husband (the one in our in the family with the Italioan blood) tried your focaccia today and it was delicious! We also used the same recipe (without the sugar in the dough) to make pizza, rising it only the first time, both absolutely yummy. Thank you! Foccaccia is something I'd like to make. One of those things you often see and wonder what it tastes like. Tziranda, that is excellent news! I'm so glad to hear you liked the recipe - thank YOU for letting me know how it turned out! Tried this one with oregano instead of thyme and the two of us finished it in only 2 sittings. Very good indeed. Do you recall which issue of Australian Gourmet Traveller was it originally in? Bee, that is great news! I'm so glad you liked the recipe, tks for letting me know!